If you like Pin More check out Snowy Dune Launcher. Pin custom tiles for Steam, Origin and Uplay games, documents, document folders and websites to your Start screen! Create static tiles with any image you want as logo or use up to 5 images to create a live tile that cycles between them. You can also create live tiles for your Steam games that display your achievements or for your favorite websites displaying their latest news (only for websites that have some metadata). Choose the background color you want to use by either picking one of the default colors, using our color picker, entering the RGB values of the color or even picking a color directly from any of the tile images. Export the tiles you've pinned so you can share them with your friends, import them on other devices or just keep them as backup so you don't have to create them again if you need to reinstall Windows. Do you have any questions? Are you having any issues with Pin More? Do you think some feature should be added or improved? Let us know! Fixed crash that could happen while applying website metadata. Fixed crash that could happen while cropping an image. Fixed crash that could happen while opening a file or folder in a pinned folder. Fixed crash that could happen after pinning a Steam, Origin or Uplay game. Added filters for the Steam, Origin and Uplay lists. Added some file types to the list of accepted file types for document tiles. Fixed issue where using some Png images could result in blank tiles. Fixed issue where the selected scaling algorithm wouldn't be used in some cases. Fixed issue where a live tile with a single image would be created for websites instead of just creating a static tile. You can now pin Uplay games. Added lock screen support so live tiles can be updated when the device is unlocked. 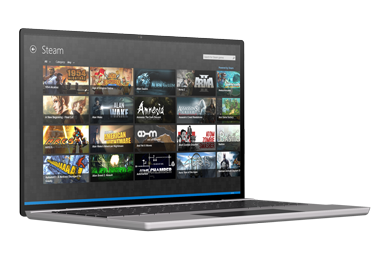 Improved performance and reliability of the task that updates Steam live tiles. Improved performance of Steam and Origin games lists. Fixed crash that happened while importing a tile that wasn't fully uploaded to OneDrive. Added option to use custom RSS/Atom feeds for website live tiles. 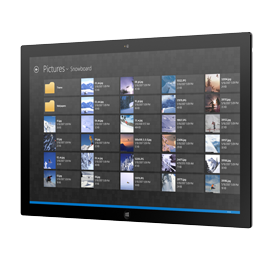 Improved performance and reliability of the task that updates website live tiles. Fixed crash that could sometimes happen while loading the list of Steam games. Fixed crash when an image that couldn't be downloaded correctly was added for any tile size. Fixed issue where some non-Steam games weren't loading the images set in the Steam client grid correctly. Images for non-Steam games are now loaded automatically if they have custom images set in the Steam client grid. Improved live tile data check for websites. Fixed crash when trying to pin an Origin game which had an image that wasn't downloaded correctly. Fixed crash when loading an Origin game list that wasn't downloaded correctly. Fixed issue where Steam images weren't downloaded correctly. It is now possible to pin Origin games. Added option to choose whether to show achievements or just the time played in the live tile for Steam games. Fixed issue where some Steam games that don't have achievements wouldn't get a live tile displaying the time played. Fixed issue where a live tile displaying 0 hours played would be created for non-Steam games. Fixed issue where live tile data for some websites wasn't read correctly. Fixed issue where the launch screen would be shown for folders. Fixed crash that could happen while pinning multiple Steam games. Web tiles that have a local network url can now be launched correctly. Steam games that don't have achievements can now have a live tile that displays the time played. Fixed issue that could cause website live tiles to stop being updated. Fixed crash that could happen while pinning a live tile. Added Publisher and a couple of programs extensions to the list of accepted file types for document tiles. Fixed crash that could happen while trying to add a logo image. Fixed crash when opening some document tiles. Fixed crash when setting up Pin More to add non-Steam games automatically. Fixed crash when trying to delete files in a pinned folder. Added MS Project and some e-book extensions to the list of accepted file types for document tiles. Improved stability of the background tasks responsible for the live tile updates. Fixed crash when trying to pin a website showing more notifications than those actually available. Fixed crash when trying to pin a Steam game with a big logo showing more unlocked/locked achievements than the number of unlocked/locked achievements for that game. Fixed crash when the selection was changed while multiple Steam games were being pinned. Fixed crash when trying to import a website tile. Fixed crash when the app was launched using the url protocol. Fixed issue where non-Steam games would be classified as websites if their url had uppercase letters. Added option to check for website tile data so title, logo images and background color for the tile can be extracted automatically from websites that include that information. It is now possible to create live tiles for websites using the check for website tile data option if the website specifies live tile data (same data used by IE11) or an rss feed. Fixed issue where live tiles with multiple images wouldn't be created correctly for websites. Added setting to choose whether to sync tiles by default. Fixed crash when trying to edit a pinned tile that was synced. Fixed crash when opening some pinned folders, usually folders in network drives. Fixed crash after pinning a non-Steam game that should be in the last position of the list of games. Fixed crash that would randomly happen when adding an image or pinning a tile. Fixed issue preventing Steam live tiles from updating correctly when one of the Steam tiles was a big tile. Fixed issue preventing Steam live tiles from updating correctly in some devices. Fixed issue where the url of a non-Steam game was deleted after cropping an image. Added support for the new Windows 8.1 tile sizes. Added support for the new Windows 8.1 window sizes. Added option to sync Steam and web tiles. Added open with, rename and delete commands to the file explorer for pinned folders. Tiles in the all aplications view of the Start screen now use your custom logos too instead of using Pin More's logo, only applies to tiles pinned after this update. 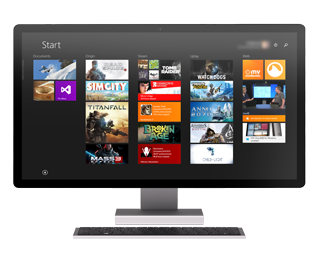 Fixed issue where some images wouldn't be displayed correctly in the Start screen resulting in an empty tile. Some additional fixes and improvements. Fixed issue preventing the app from launching in some cases. Fixed issue that could make the app crash when switching the Steam profile. Fixed issue where the app would crash when trying to crop images with width and height greater than 3100px. Fixed issue where images weren't loaded correctly if their name contained '%20'. Fixed issue making the app crash when one of the non-Steam games files was deleted in a Steam update. Added option to sync settings. Added option to choose which algorithm to use when scaling images. Fixed issue preventing Steam live tiles from being updated. Fixed issue where trying to pin/edit a Steam game that was unpinned in the Start screen while the app was still open would make the app crash. Fixed issue where the time played for a Steam game wouldn't be read correctly in some cases and cause the app to crash. Fixed issue where the app would crash if an image with a name that contained some characters like '#' was picked. Fixed issue causing some png images to be loaded incorrectly when used as logo or wide logo. Fixed issue where the Steam section would be stuck displaying previous search results after pinning a game without having the option to cancel the search using the back button. Moved switch profile and refresh buttons to the bottom command bar and the search button to the top right corner in the list of Steam games so the list uses the full width of the screen. Fixed issue where non-Steam games wouldn't be added to the list of Steam games after configuring their automatic discovery until Pin More was restarted. Fixed issue where trying to connect to a private Steam profile would result in an "Unknown Error" message instead of "This profile is private". Fixed issue where the Steam folder wouldn't be detected correctly depending on Windows language. Added option to crop tile images. Added option to set up Pin More so it can add your non-Steam games to the list of games automatically. Added option to pick a background color from the tile images directly. Improved performance and UI behavior of the Steam games and Pinned tiles lists. Added Share charm support to share tiles from the Pinned section. Improved exported .tile files to include different versions of each image so they can be imported with a better result in devices with a different DPI. Pinned Steam games are now marked as pinned in the Steam section. Added filters for the different types of tiles to the Pinned section. Fixed issue causing the App to crash when trying to export a Steam tile created in older versions. Added option to export and import tiles using .tile files. Added option to change between detail and thumbnail view while exploring a pinned folder. Added option to increase or decrease the size of the items while exploring a pinned folder. Image size recommendations now take into account the DPI of the device. You can now pin .iso files in the Documents section. Added option to pin document folders.